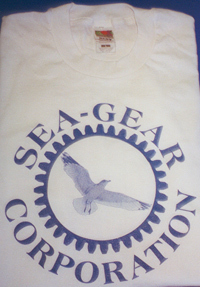 Let everyone know you are a loyal customer by sporting your very own SEA-GEAR T-shirt with out Seagull in Gear logo recognized around the world. 50/50 cotton/polyester fabric. White with bright blue logo. Available in adults large and extra large.